IMCDb.org: 1978 Subaru 4-Wheel Drive Wagon [A67L] in "Baywatch, 1989-2001"
We have a Subaru Wagon in front, a VW Rabbit/Cabriolet on the right and a Ford Fairmont on the left. 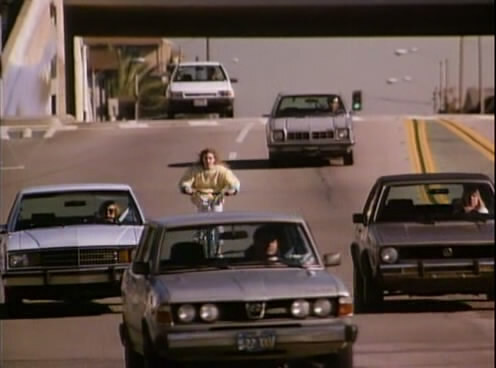 A Chevrolet Chevette in the center of the pic and what looks like a Mazda 323/Protege in the back. Comments? The one in the back isn't a Protegé, but maybe a Ford Festiva. US model, not a Leone, 1978-79 4-Wheel Drive Wagon model.